Here is a really versatile pincushion pattern to purchase, as it comes with the crow pattern, but made four different ways. 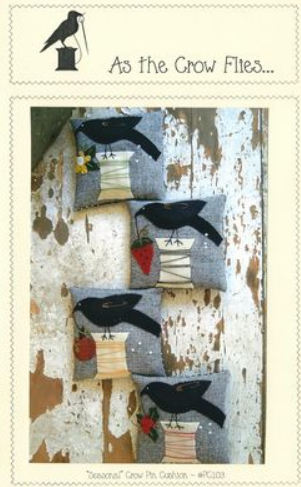 Whatever the season, there is a crow cushion for it! Spring, Summer, Fall, and Winter - Same crow on a spool, but the crow is holding a Sunflower, a Strawberry, a Pumpkin, or a sprig of Holly! Make all four and swap them as the seasons change - or give them away as gifts to your quilting and sewing buddies!